New users will often try to get by with using their host’s cPanel software for file transfers and NotePad or TextEdit for editing the custom.css and custom_functions.php files. It’ll work, but it’s clunky and frustrating, at best. For more than casual work with Thesis, you need to get separate programs for FTP file transfers and for editing your custom.css and custom_functions.php files. Trying to use your host’s cPanel or similar software for file transfers is an exercise in frustration, as is trying to change permissions. And TextEdit will try to change your files to the totally incompatible .rtf format if you don’t keep a close watch on it. Even the editor in the Thesis OpenHook plugin is pretty basic. 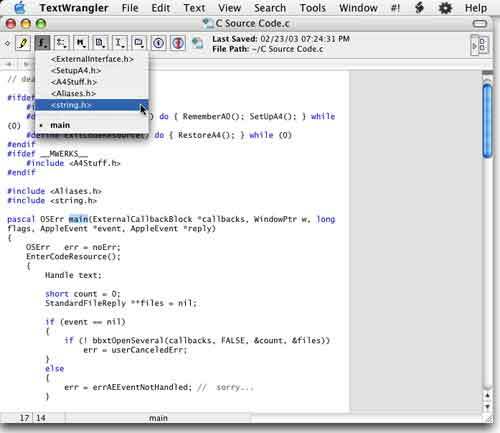 TextWrangler is a powerful text and programming editor from BareBones Software, the maker of the venerable BBEdit text editor. It does not have all the features of its big brother, but TextWrangler has more than enough power to edit Thesis files efficiently — and it’s free, while BBEdit costs $130! Of course, there are many other fine FTP programs and text editors out there, but they are not free! And for all but the most serious Thesis work, they will not do any better than Cyberduck and TextWrangler will. I hope you will take the plunge soon and get you some good tools for your Thesis work — you’ll thank yourself! And I hope you found this information helpful. Please feel free to leave a comment or send me an email using the “Contact” button!